Diversity: 41% of students are African American, Black, Asian American, Hispanic, Native American or multiracial. The University of South Florida is a large, public 4-year university offering undergraduate, graduate, specialist and doctoral level degrees. The USF System includes three, separately accredited institutions: USF; USF St. Petersburg; and USF Sarasota-Manatee. 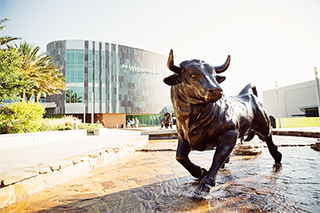 Serving more than 50,000 students, the USF System has an annual budget of $1.7 billion and is ranked 45th in the nation for research expenditures among all universities, public or private.